The Extension Board is perfectly designed for continuous and heavy usage. Connect more than 5 devices at a time. Made of top quality material to perform long. If you use lots of electronic devices then one wall socket is not enough for you, you need an extension board. If your charger cable is not long enough and you want to use the device at some place far then you can have an extension board. 3 USB ports provide additional charging options. Total deliver 17 watt, 3.4Amp powerful charge. Smart IC technology with smart chipset. Provices efficent and safe charging. Universally compatibility with devices supporting 5V USB charging. 900 Joule energy rating provides superior protection of all your electronics. The indicator light assures connected electronics are protected from surges or spikes. keep your computers, kitchen appliances, standard household electronics safe from surges, lightning strikes, and AC contamination. Simple and secure installation, with outlet mounting screw included. The integrate stabilizing post, makes Huntkey wall mount outlet more secure and convenient. Easy to set up and use, just plug into an existing grounded outlet plate to power to your home appliances and USB charged devices and expanding an existing grounded outlet plate into 3 AC sockets & 6 USB charging ports, suitable for TV, PC, notebooks, smart phones, tablets, etc. NOT recommend to GFCI and USB receptacles, the stabilizing post may be cut off to be used in these receptacles. 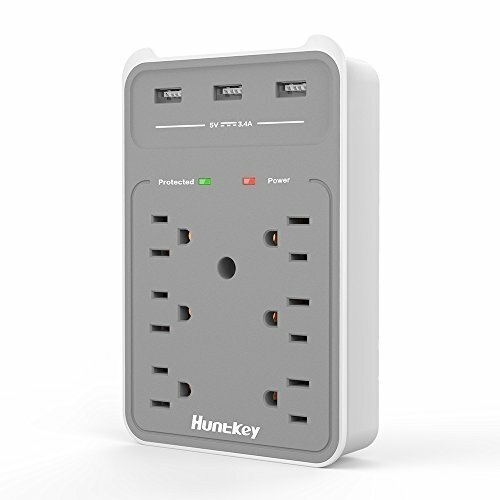 Simply plug this it into an existing wall duplex receptacle and extend it into 6 outlets + 3 USB charging ports. Surge Protector, 900 joules suppression rating provides reliable protection for all your devices at home and office. USB Smart IC Technology, 3 Lightning Fast Charging USB ports are sharing 17 watts / 3.4 Amps of power. Convenient Cradle Ledge holds your devices stably while charging. ETL & FCC listed, Complies with DOE VI, 3-Year warranty.